My kids will often bring shoes to me – they don’t always match, and most often they just want to try the very large shoes on their very tiny feet – but when Theo brought me a matching set of my running sneakers and laid them nicely at my feet today, I took it as a meaningful suggestion. I’ve been putting off making any kind of a sacrifice (on my part or the kids’) to get in my 3 10k runs a week. Things like having to push 60lbs of children in front of me, or using what could be ‘fun time’ in the backyard for them (which equals sitting-on-the-lawn time for me) have been legitimized in my brain as reasons not to run during the day. The result being, of course, that I don’t get in the runs that I want. So today, I took Theo’s behavior as a sign and broke the pattern. 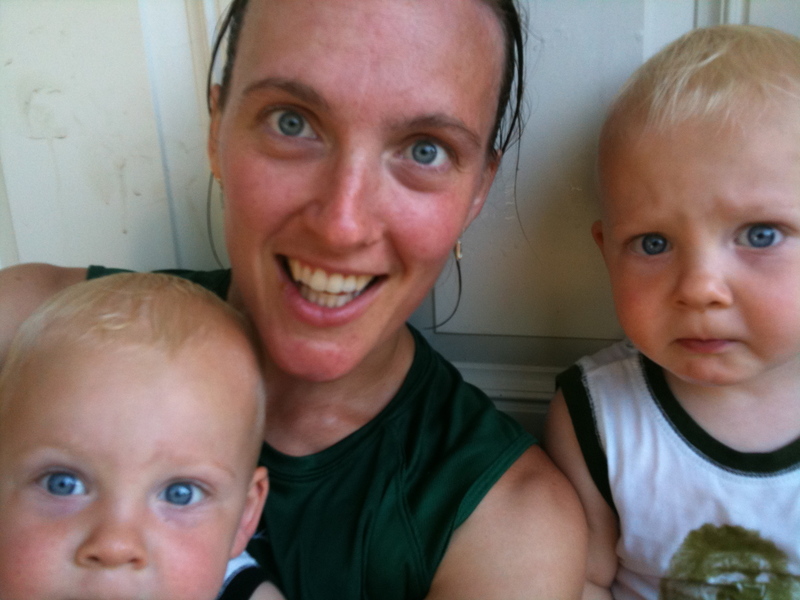 In order to break the pattern, and go for a run with the twins in tow, several things had to happen: 1) change the kids diapers, 2) prepare juice cups for the stroller ride, 3) change my own clothes, 4) prepare some liquid for myself, 5) and check the temperature outside to decide on a route. Clearly, sacrifices were going to be made today. I began with changing the diapers, as that usually takes the most time due to a recent hate of holding still long enough to get a diaper back on. I brought Theo into my room, hoping that the treat of lying on Mommy’s bed would help the process go smoothly. Things started out well. He lay there nicely while I got the wet diaper off, wiped him clean, and put the clean diaper under his bum. At this point, Moses decided that he was missing out on the fun and started pulling on Theo’s foot, loudly complaining ‘Ma, maaaa, maaa!’. Theo decided to take this distraction as an opportunity to roll towards the head of my bed. 4 attempts later, I was still flipping Theo back onto his back to secure the clean diaper and Moses had dragged a ride-on car into the bedroom which he was now using as a step up to the bed. Each attempt at getting onto the bed caused the car to roll away from him and wound up dumping him back onto the floor – I wrestle Theo back to the bed, and speak comfort to Moses. Finally, I get a diaper on Theo (who by now has thrown three novels onto the floor), and save Moses from his 3rd spill onto the floor. I begin changing Moses, and Theo attempts to play with the stained glass lamp on my bedside table – I put Theo into the laundry basket to keep him out of trouble while changing Moses. Moses is now half-way across the bed and trying to slide down to the floor. I pull Moses back onto the bed. Theo now begins to cry as he has gotten himself into the splits position trying to get out of the half-full laundry basket. I finish Moses’ diaper and rescue Theo. I am already feeling like I’m getting my exercise for the day. I begin to change my own clothes, both kids now at my closet doors and beginning to pull down hats and rifle through Mommy’s work bag – Remove kids from closet, resume changing clothes. Both kids now pulling all clothes out of my bottom dresser drawer. Grab socks, and begin to seriously re-think all the effort being put into going on this run, which will likely not be 10k and will likely last only as long as the kids are content in the stroller. But! I am trying to break my bad-habit pattern, so decided to stay the course. Both children now trying to play with the lamp – unceremoniously remove both children from my room, head to the door – juice in tow. Kids into the stroller, realize that although the temp says 22 degrees, it actually feels like 30 to me – re-think the run again, but am too far to turn back now. Begin run – am now questioning my decision to run in the heat at 4pm in the afternoon. Run into the forest to avoid the direct sun. Pass a young couple kissing in the park – am jealous. Pass a single woman walking leisurely while listening to her iPod – am envious. Begin sweating profusely, but am glad as the feeling of the air on my sweaty skin is cooling. Realize that I have forgotten how different it is to run pushing 60lbs vs. running by myself. Pass a panting dog – am sympathetic and give the dog a silent high-five. At this point my run is a success, in terms of my kids. Both of them are silent with the odd comment on local wildlife, but the run is seriously weighing on my mental stamina, as well as my abs. I finally give in to the stitch that began stabbing me in the side 15 minutes earlier and I decide to walk/run in intervals. I slow my pace to a walk and take a deep breath. Both of my toddlers start counting – ‘1,2,3 – go!’ ( which really sounds like ‘da-daa-daaa – go!’) and I start wondering why they are counting. The counting continues, followed by whining which increases in volume until I begin my running interval again. I cannot believe it! My kids want me to run! They really want me to run! Not only did they bring me my shoes, which could easily have been misinterpreted as some kind of sign, but now they are cheering me on! (Don’t worry, I know that in reality they have gotten used to the pace of the stroller and they likely don’t want to slow down), but I take the counting as another helpful hint and run the remainder of the way home – completely red-faced and stitch-bearing. I make it home and take both kids out of the stroller and spend the rest of our time before supper running through the hose with my kids. It wasn’t 10k, but it was a successful run. One that required some sacrifice from me and my kids, but one that also brought encouragement to me both as a runner and a mom. I just cannot deprive you of a post-run/hose-soak photo. Please note the red face, wet hair, and slightly-crazed eyes and enjoy laughing from the bottom of your belly! This is what happens when you take your lead from your toddler. This entry was posted in 5-10 km, Challenges, Running with your kids. Bookmark the permalink. My dear, you are an inspiration. I’m sorry but I was cracking up laughing at your diaper adventures! Seriously. You are my hero. Next time I even think about complaining about how hard it is to run with everything I do, I’m going to force myself to read this again. I love your attitude. Please help me adjust mine, lol. You set a goal, and while you ended up amending that goal, you still remain positive in what you did accomplish. Go you. P.S. Your kids are awesome. Honestly, my attitude isn’t always positive, but I have learned that when I am about to turn into Stress-phanie I need to find something that will make me laugh. This has not always been my philosophy – but with two cutie-pies watching me constantly I have found that it’s the only way I’ll survive. At times I have even taken to forcing myself to ‘fake laugh’ until a real one pops out. Once a real one is on it’s way both I and the kids relax – it’s a necessary survival tactic! Preparing for the run yesterday I could feel myself getting stressed, so I laughed (through clenched teeth at first) and then imagined that I was watching the whole diaper-change event through someone else’s eyes and I cracked up! haha! It’s all about survival isn’t it?